Virgin Australia has received a setback in its efforts to maintain flights to Samoa after the country’s government denied the airline’s application to operate flights between Apia and Auckland. 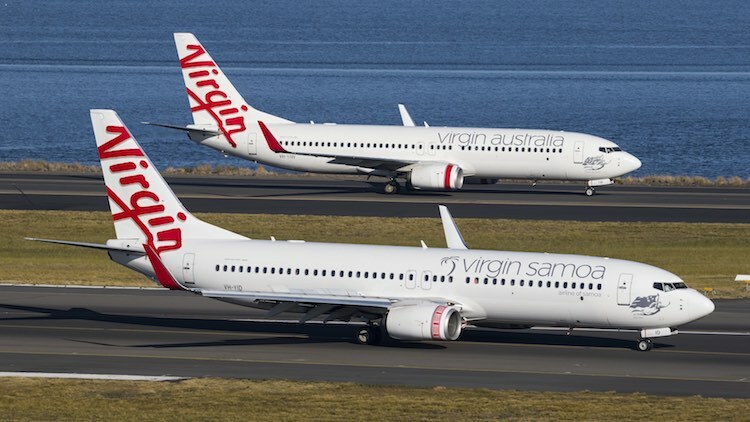 While flights from Brisbane and Sydney to Apia will go ahead on November 13 as previously planned, Virgin Australia has been forced to cancel its five weekly Apia-Auckland service with Boeing 737-800s. The airline said it had removed the Auckland flights from sale, describing the Samoan government’s decision as “out of our control”. “Virgin Australia wishes to advise that the Samoan Government has denied authorisation of our scheduled services between Auckland and Apia,” Virgin Australia said in a note to travel agents on Monday. “We are disappointed by this decision and at this stage are working in conjunction with the Australian Government to explore options to encourage the Samoan Government to reconsider its decision. Affected passengers have the choice of travelling via Brisbane or Sydney, changing their ticket to a different destination, getting a refund or receiving a travel credit for use on a future Virgin Australia ticket. “We would like to thank our guests and industry partners for their continued support, patience and understanding,” Virgin Australia said. In September, Virgin Australia said it would maintain services to Samoa following the wind-up of its Virgin Samoa joint-venture with the Samoan government and began selling tickets for five flights a week on the Apia-Auckland route, two flights a week on Apia-Sydney and up to two weekly services between Apia and Brisbane with Boeing 737-800s featuring eight business and 168 economy seats. Media reports at the time said the Samoan government’s decision to ditch the JV was due to concerns over high fares. In its place, Samoa Prime Minister Tuilaepa Sailele Malielegaoi’s government established Samoa Airways in partnership with Fiji Airways. Samoa Airways will offer six weekly flights from Apia to Auckland and two flights a week from Apia to Sydney with a leased Boeing 737-800. As a result of the decision to deny Virgin Australia authorisation for Auckland-Apia, Samoa Airways and Air New Zealand will be the only two operators on the route. Its obvious that the profit fundamentally lies in the Auckland – Apia route. Since they can’t say no to ANZ, Virgin got hit. I am sure they would stop ANZ to if they could. Now even less revenue for Virgin. First Bali now Apia. This does seem a bit fishy. Samoa Airways happens to start flying to Auckland, while Virgin Australia is denied continued service on that same route? That seems unfair, if this new airline cant compete with Virgin and ANZ then they should find different routes they can make money from and take risks! virgin need to “build relationships more” (i.e. $$$ baksheesh or build infrastructure)… what do they expect?? People and business are arrogant and forget the nation has a right to choose!!! Maybe they should consider that more than pay increases for greedy ceo’s!!! Its not great, but fair enough. Air New Zealand is based in NZ and Samoa Airways in Samoa. So now that Samoa wants to establish its airline Virgin Australia should stick to the Australian Market. If Samoa Airways booms its only to our regions benefit. Virgin will be fine, maybe they can redeploy there aircraft elsewhere. Ian Morris, I can’t help but think you’re being a little simplistic. There is no friendliness between Air New Zealand and Virgin, ever since Air NZ sold their part of Virgin and walked away. Had this not been the case, I feel certain this would not have happened. Besides, it’s naive to think that only a national carrier can reciprocate flights. Qantas operates Auckland to USA sectors. Should we ban them too? @ Dunover. Qantas hasn’t flown from Auckland to the US for a long time using its own aircraft. The flights back then were using fifth freedom rights under the Chicago Convention. If Virgin’s flights were originating in New Zealand, the flights would come under the auspices of the air services agreement between Samoa and New Zealand. The Australia – Apia flights are not affected and Virgin can sell seats for those flights. Google Flights Sydney to Norfolk Island, and that may blow your argument out of the water, Air Nz operates on the route direct! From memory, I don’t think 5 freedom on the route. Hence only flag carrier is allowed. If they are really desperate to operate the routes, go with Qantas ideas and have 5 or so planes with ZK regos, then there really shouldn’t be any issues. @ Conor I believe VA used to have some ZK registered planes, maybe it wasn’t worth their while with the extra admin costs? As far as I’m aware though Australia and NZ have an open skies air services agreement which includes the ability to fly domestically, hence the SYD – NLK and RAR flights by ANZ, and JQ flying domestically in NZ. Is anyone aware why those same privileges aren’t extended to VA in what seems like an identical situation? It seems like blatant protectionism, which doesn’t help anyone long term.